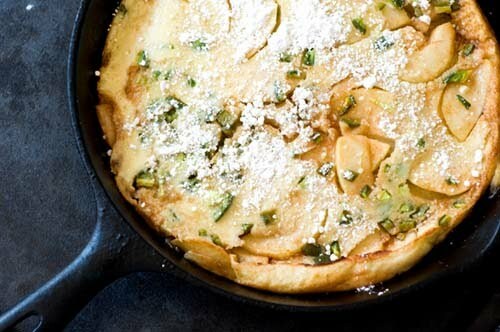 Its Friday…try this Apple Dutch Baby with Green Chiles. Yep its Friday and I have had a full week. I haven’t done much sewing or creating these last few days so I thought I would share this recipe with you from Homesick Texan. I am excited to try this recipe and tonight I will get to. I will let you know exactly how it turns out and any other comments you might need to know. And in honor of my new new great nephew born this morning, I thought a dutch baby was appropriate. Preheat the oven to 425 degrees. In a 10-inch ovenproof skillet, preferably cast-iron, melt the butter on low heat. Add the apples, sugar, cinnamon and salt and while occasionally stirring, cook the apples until soft, about 10 minutes. For the complete blog post from Homesick Texan click here. 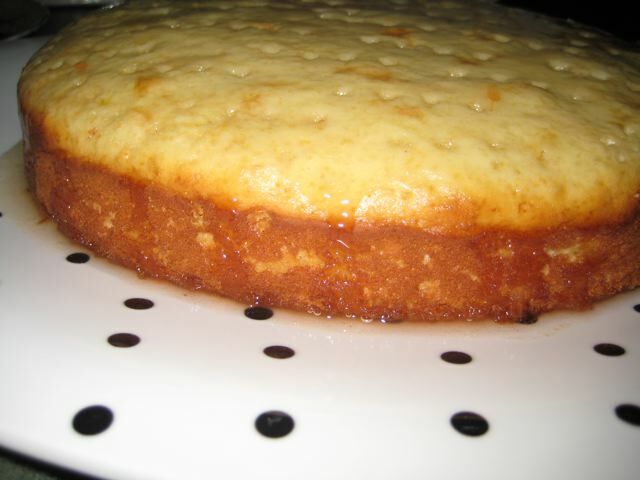 This entry was posted in RECIPE on September 17, 2010 by Deanna. I wanted to make some caramels to give to friends for Christmas and I found this recipe over at Givers Log. Amber Lee has shared a wonderful caramel recipe, try it if you don’t already have a caramel recipe that works. 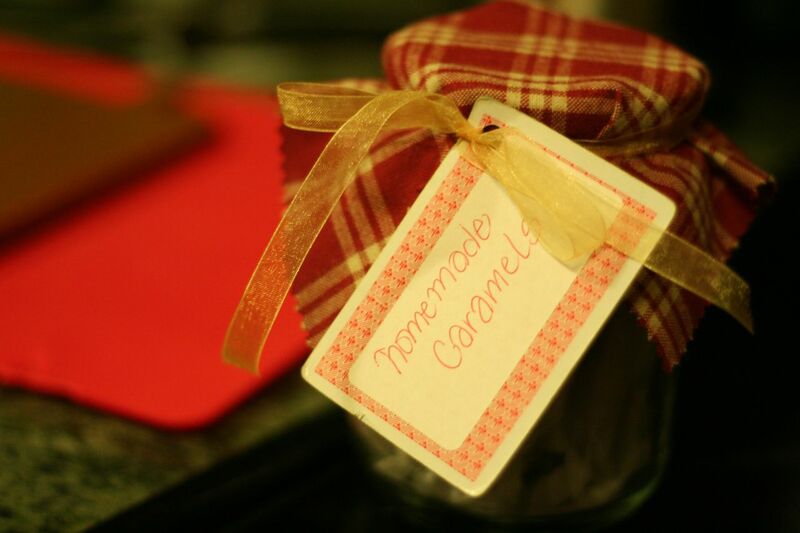 I recycled a jam jar to put the caramels in to give as a gift. Homemade Caramel (or caramel dip) Adapted from the Givers Log. Every time before using a candy thermometer, clip a candy thermometer onto a pan full of cold water and bring it to a boil (make sure the thermometer is not touching the bottom of the pan). I cheat on a lot of things, but I never cheat on this. Boiling water should read 212°. Once the water is boiling, make note of any difference in your reading, and adjust your reading accordingly when you make the candy (for example, if thermometer reads 210° in boiling water instead of 212°, then take caramel off at 242° instead of 244°). Add and mix sugar, corn syrup, and sweetened condensed milk (or cream). Take care to pour sugar in center of pan. If any sugar crystals stick to side of pan, push them down with a damp pastry brush so they do not crystallize the entire batch and make you want to cry. Cook and stir on med.-high until boiling. Once boiling, clip on your candy thermometer (again, don’t let it touch the bottom of the pan). Reduce heat to about medium, adjusting so that you keep a moderate, steady boil. Stir frequently. Temperature does not raise at a steady rate, so watch thermometer closely. 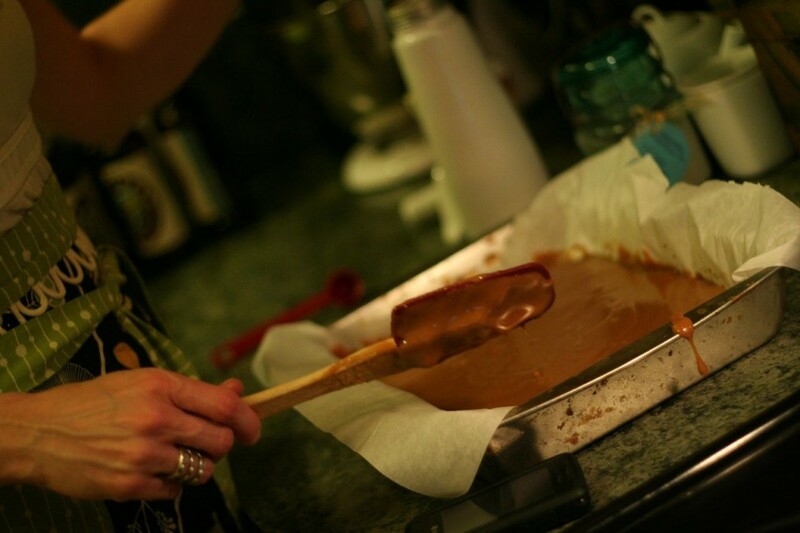 When your thermometer reaches thread stage (230–233°), take out any caramel that you would like to use as dip. When thermometer reaches late soft ball stage (234–240°), dip in a few apples for caramel apples. 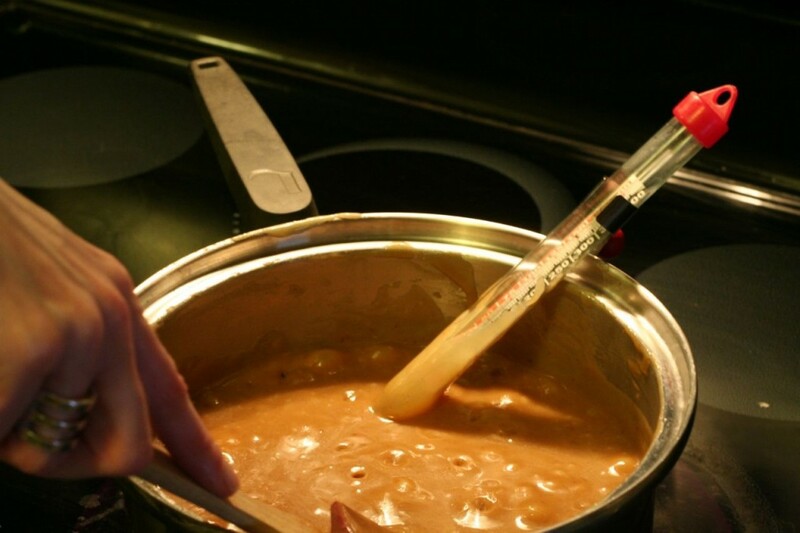 When thermometer reaches 244°, remove caramel from heat (this is low firm ball stage; reaching this stage from boiling will take about 30 minutes with sweetened condensed milk and longer with cream). Allow to cool for several hours and use a butter knife or kitchen shears to cut pieces (UPDATE: a clever reader suggested a pizza cutter, I’m looking forward to trying this). Wrap in wax paper. Or to save on cutting time, just leave the whole batch out on the counter with a knife next to it and watch it gradually disappear. I think I actually did it! 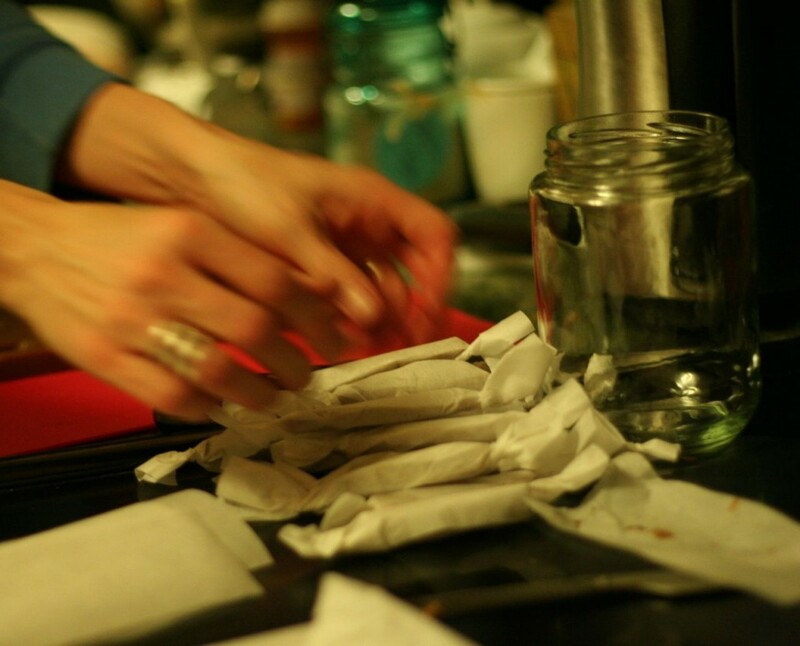 Wrapping the caramels in parchment paper. This entry was posted in food, Holidays, RECIPE, Recycled on December 21, 2009 by Deanna. Ok so I made these sweet dinner rolls a few days ago and I loved them. Reading through the reviews, one person said to try making cinnamon rolls out of them. So I decided I would give it a try. Of course that meant going blindly into it, knowing how to start it but not knowing how to finish it. I have made cinnamon rolls before so i figured it would be easy. Just roll the dough out, add some butter, cover with cinnamon & sugar, roll up and cut with string. Easy Refrigerator Yeast Rolls from allrecipes. In a small saucepan, heat margarine and water over low heat. When margarine has melted, remove pan from heat and stir in salt and 1/4 cup sugar. In a small bowl, dissolve yeast and 1/4 cup sugar in 1 cup warm water. Let stand until creamy, about 10 minutes. In a large bowl, combine yeast mixture and margarine mixture. Stir in beaten eggs and 2 cups self-rising flour. Beat in remaining flour 1 cup at a time, mixing well after each addition, until a stiff dough is formed. Divide dough into two pieces and place each piece in a well oiled freezer bag. Refrigerate for at least 24 hours. Remove dough from refrigerator. Pull off pieces of dough and form into 2 inch diameter balls. Place in lightly oiled baking pans so that edges of balls are just touching. Cover and let rise in a warm place until doubled in volume, about 2 hours. Preheat oven to 375 degrees F (190 degrees C). Bake dough balls 15 minutes, until golden brown. A recipe I am thinking of trying next is from Joy the Baker – Cream Cheese Cinnamon Rolls. 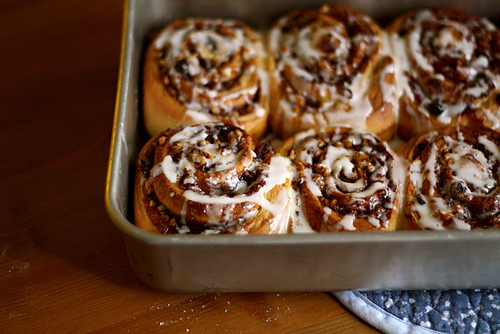 If that doesn’t work than I may just have to try this recipe from epicurious – Cinnamon Rolls with Cream Cheese Glaze. This entry was posted in food, RECIPE and tagged cup margarine, diameter balls, heat margarine, self rising flour, yeast mixture, yeast rolls on November 12, 2009 by Deanna. At my favorite food blog, Joy The Baker, I found this recipe, Pink Grapefruit Yogurt Cake, decided to make it and I loved it. Now I am sharing it with you. Her photos are amazing, so check out her site. I know I am not a food blog, but I love food and when I find something I love, I have to share. This cake is the perfect combination of sweet and fruity, and the consistency is a bit dense but oh so moist. Goes great with a cup of coffee. But I’m sure their aren’t many things this wouldn’t go well with. Juice and zest of 1 pink grapefruit. This ends up being about 1/2 cup of juice and 1 Tablespoon of zest. Position a rack in the center of the oven and preheat the oven to 350 degrees F. Grease a 10-inch round springform pan and line the pan bottom with a parchment paper round and set aside. I used a Bundt type springform pan, greased and floured well and skipped the parchment paper. In a medium bowl, whisk together the flour, baking powder and salt to blend. On a clean surface, or in a large bowl, combine the granulated sugar and zest. With the back of a spoon or a flexible bench knife, rub the grapefruit zest into the sugar. The essential oils will release into the sugar creating a beautifully fragrant sugar. In a large bowl, beat the eggs and grapefruit sugar until the eggs are thick and pale yellow. Add the yogurt, oil, 1 Tablespoon of grapefruit juice and vanilla extract. Stir well to combine. Add the flour mixture and stir to combine. Pour the batter into the prepared pan, smoothing the top with a rubber spatula. Bake for 30-40 minutes, or until the top is golden brown and a wooden skewer comes out clean when inserted near the center. Place the pan on a wire rack for 10 minutes to cool. Run a knife around the edge of the pan to loosen the cake Release and remove the pan sides. Coo completely on the wire rack. In a small saucepan, combine the powdered sugar and the remaining grapefruit juice and bring to a boil Reduce the heat to a simmer and cook, stirring, for 10 minutes, or until the glaze is slightly thickened. My glaze didn’t thicken significantly, but still seemed to do a great job on the cake. Remove from heat. To finish the cake, invert the cooled cake and remove the pan bottom. Carefully peel away the parchment paper if you used it. Re-invert the cake onto a serving plate. Pierce the cake all over the top with a skewer and pour the warm grapefruit slowly over the cake. I did this with the help of a pastry brush. Store at room temperature, wrapped well for 2 days. This entry was posted in RECIPE on February 13, 2009 by Deanna.